Social media apps that offer anonymous profiles are becoming popular with preteens and teens. It may seem like online anonymity would offer protection and increased safety for users, but it does quite the opposite. Apps that allow users to interact anonymously create a dangerous online arena where aggressive users can bully and harass without repercussion and casual users can accidentally connect with dangerous strangers. The following apps have received negative publicity for their inability to moderate cyber-bullying, and many parents are calling for them to revisit their harassment policies and systems. But it seems that the companies are not reacting to the potential dangers quick enough. Foutune.com tested Secret’s anti-bullying system, and it failed. The site was unable to identify and remove the inappropriate content they posted, even after other users added more negative and harassing comments. Since Secret and other similar platforms don’t include systems that can appropriately protect your child from dangerous users and harassment, MamaBear recommends not allowing the following social media apps be installed on your child’s phone. Yik Yak: This app shows a feed of updates that people in the surrounding geographic area have posted. Users can comment on posts or upvote them to raise them to the top of the list. Although the app is for users 17 and over, younger kids regularly create accounts. They use the platform like a gossip bulletin board and write mean things that may get upvoted to the top of the list and be difficult to take down. Ask.fm: Users post questions and answers on other users’ questions. The site offers options to share posts on Facebook. Users often hide behind the site’s anonymity and post harassing text and photo responses to questions, or post mean questions that call out people by name. Tinder: It shows a stream of photos of users that are located with a certain mile radius. Users say yes or no to each photo, indicating if they would like to engage with the person. If both users say yes, the app allows them to connect. Younger users should not create accounts as Tinder is intended for an audience 17 and over and is often used by adults as a “hook-up” app. Secret: Users can post “secrets” which are shared with friends and comment on other users’ secrets. If a friend “likes” a secret, it is then shared with their list of friends. Users can’t see who shares secrets or posts comments. Many users have complained the site does not stop anonymous users from sending harassing and bullying comments. These apps are not set up to protect young users, and they do not have the proper systems to flag inappropriate use or moderate comments. They enable bullying and have created a dangerous social space that your kids should avoid. 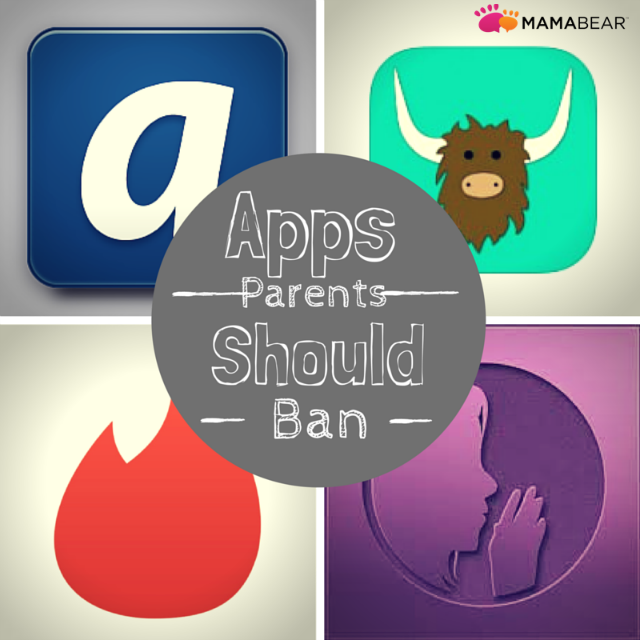 Talk to your kids about acceptable social apps and actions, and ban these apps. Then protect them by connecting with their social media accounts through MamaBear Family Safety app – currently monitoring Instagram, Twitter and Facebook. The free app, available for both Andriods and iPhones, makes it easy to review how you child is interacting on social media.